1. Preheat the oven to 180˚C, gas mark 4. Melt the butter in a pan and sweat the shallots over a medium heat for 3-4 minutes, until softened. Pour in the cream and bubble for a few minutes, then take off the heat and add the watercress. Whizz together in the small bowl of a food processor to a smooth sauce; season. 2. Add the nutmeg to taste (you want quite a pronounced flavour), then quickly blend in the egg whites. Divide between 4 small ramekins. Put an egg yolk into each so that just a glimmer of yolk is visible. 3. 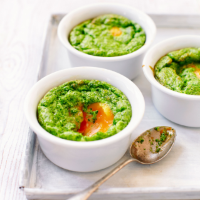 Put the ramekins on a baking tray and bake for 12-15 minutes, until the watercress mixture has puffed up and set, but the yolk is still a little runny.